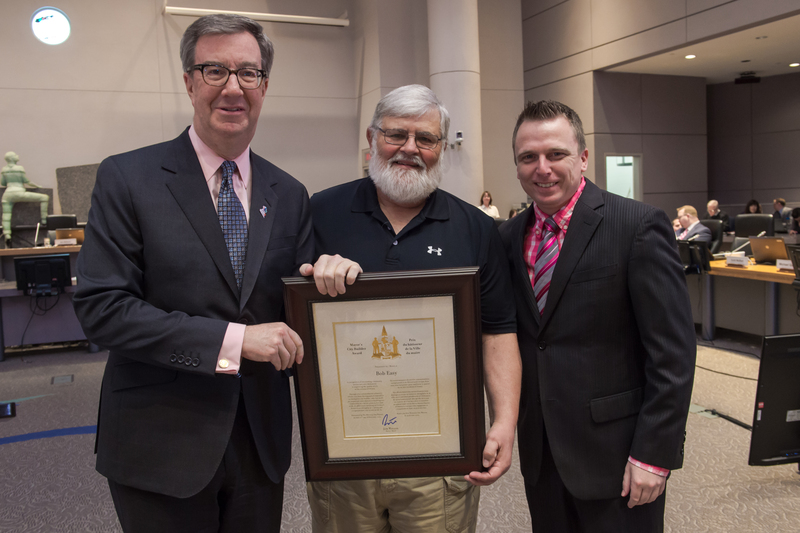 Ottawa – Mayor Jim Watson and Rideau-Goulbourn Ward Councillor Scott Moffatt presented the Mayor’s City Builder Award to Bob Easy at today’s City Council meeting. Bob Easy has been involved in building and supporting youth in the communities of Munster and Richmond going back to the 1970s. The sense of community and of family he established among the teams he coached was sadly evident in 2012 when one of Bob’s players died tragically during a game due to a heart condition. Bob took it upon himself as head coach to support the boy’s family, his team and coaches, and the opposing team, by arranging grief counseling. He also organizes fundraising events to assist local players whose parents are unable to fully afford the cost of a hockey season; players who have been given the opportunity to play at a higher competitive level but whose parents are not able to pay the fees associated with that. In 2001 Bob was presented with a plaque in recognition of his outstanding service to Minor Hockey under the Ottawa District Minor Hockey Association. In 2009/10 he was honoured as Coach of the Year by the Richmond Munster Minor Hockey Association for his special dedication to player development and team play. In 2014 Bob was presented with the Bill Kitchen Award for his devotion of time and effort to strengthening minor hockey in the community. Bob was also involved in umpiring for fastball in Kanata for many years, and in slo-pitch in North Gower, Richmond and Munster in his later years. He is also involved in the Munster Co-operative Nursery School’s annual ball tournament in June. In 2003 Bob, assisted by Sharon Shouldice of Stittsville, organized a tournament in support of Tori Carswell, a child cancer victim in the area. Bob also volunteers as a Santa and last year he played Santa at Munster’s first Santa Claus Parade.